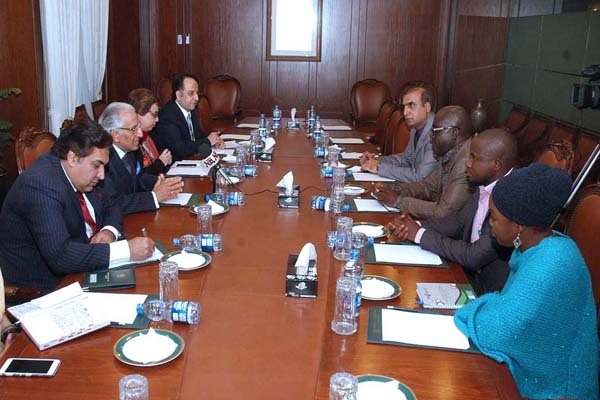 ISLAMABAD, Jan 30 (APP):A four-member media delegation from Nigeria called on the Special Assistant to the Prime Minister on Foreign Affairs, Syed Tariq Fatemi at the Ministry of Foreign Affairs here Monday. According to a Foreign Affairs statement, the SAPM expressed Pakistan’s desire to enhance relations with African countries, especially Nigeria, and recalled Pakistan’s principled stand and support to the countries of Africa in their struggle for independence from colonial rule. The SAPM also briefed the visiting delegation about the Government’s policies to strengthen the economy and resolve the energy crisis and drew attention to the Government’s foreign policy goals of achieving a peaceful neighbourhood. He explained the history of the Jammu and Kashmir dispute and apprised the delegation of the Indian atrocities in Indian Occupied Kashmir. The SAPM also briefed the delegation on Pakistan’s sacrifices in the fight against terrorism and its commitment to fight this menace. The media team is visiting Pakistan from January 29 to February 04, 2017 at the invitation of the Institute of Strategic Studies Islamabad. The visit is part of Government of Pakistan’s efforts for further outreach to African countries through public diplomacy.